Italians sure know how to launch a product with style! Upon entering the magnificent Claridges building one warm morning earlier this week, I was whisked up to a suite on the top floor, which opened up to reveal a grand pink marbled room, brimming with Roses, bouquets, candles and perfume bottles. Only Acqua Di Parma could create such an elegant yet glamourous occasion! Under the cool canopy on the roof terrace, arches entwined with roses created frames for the mesmerising views over London city, while the rose bushes evoked dreams of an aristocratic Italian garden. The event was to celebrate the launch of the Rosa Nobile women’s fragrance; one which has been described as ‘a thousand petals on the skin’ and which celebrates one of the greatest flowers, the rose. An elegant, floral scent, available both as an Eau De Parfum and a sumptuous body lotion – for that ultimate luxurious treat. 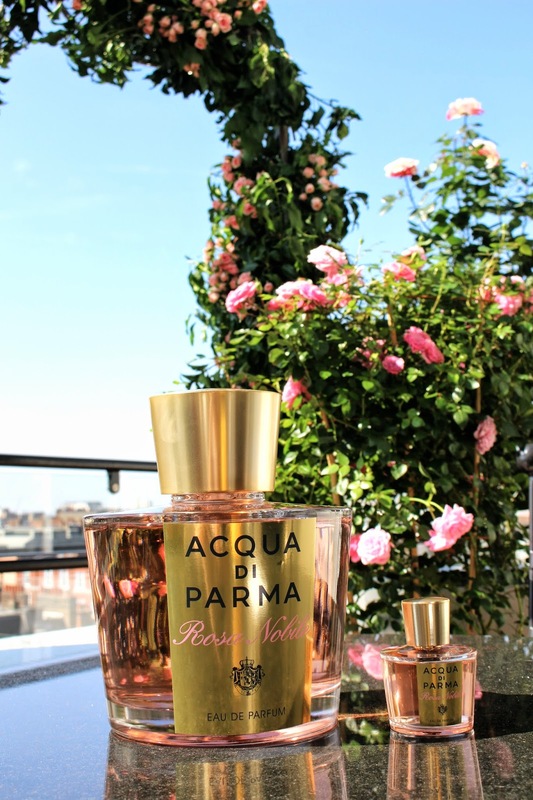 Like a secret garden on the roof, the Italian perfumery label invited us to join them on their journey into the enchanting Italian gardens, to launch the new feminine fragrance; Rosa Nobile. I spent a while listening to the journey from concept to creation, from the very passionate, Paula Paganini. Inspired by an aristocratic Italian summer garden, the new fragrance, Rosa Nobile, pays tribute to the rose flower family with a composition of rare and precious essences which perfectly suit the style of the Acqua di Parma brand. Created around an exclusive variety of rose, the Italian Centifolia rose, the fragrance first mesmerises you with accords of Italian bergamot and mandarin, entwined with spicy notes of black pepper. At the heart of the scent is a floral essence of violet, peony, lily of the valley and of course the rose scent which is blended with a sweet note of honey. Closing the fragrance pyramid (I learnt so much this day!) are notes of cedar, musk and amber, giving a sophisticated allure to the warm seductive fragrance. The fragrance and body lotion will be available from Selfridges next week, and elsewhere from September.